Dialysis is used for certain patients that have kidney failure. 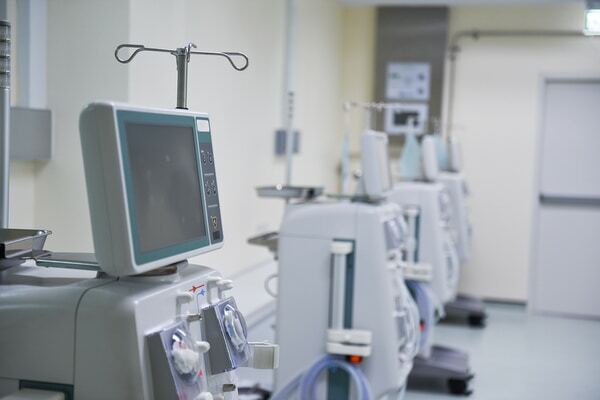 There are two types of dialysis – Hemodialysis and Peritoneal Dialysis. Hemodialysis is when blood vessel is accessed and a tube is used to transfer blood into a machine that filters your blood before it is then returned to your body. The machine essentially acts like a kidney to filter your blood. Typically a dialysis session lasts 3 hours and is given three times per week. A Nephrologist (kidney doctor) is the physician that manages all kidney failure patients and oversees the dialysis process. A Vascular Surgeon is needed to create an Arterio-Venous Fistula (AVF) or graft (AVG). This is what is accessed for the dialysis session. Peritoneal dialysis is when a tube is placed in your stomach and this is what is used to filter the toxins in your body. Your decision to use hemodialysis or peritoneal dialysis should be made with a thorough discussion with your nephrologist. What is an Arterio Venous Fistula or Graft? An AV Fistula is where a surgeon makes a connection between a vein and an artery. Usually AV Fistulas are placed in one of your arms – preferably your non-dominant arm. It is a simple outpatient operation with little to no pain after surgery. After the connection from the vein and artery is made, there needs to be a maturation period. This is when the fistula ‘matures’ or gets larger over time. When the fistula gets big enough, it is ready to be accessed for dialysis. A graft is essentially similar, except instead of using one of your own veins to make the connection, we use a tube that is tunneled under your skin. Typically, an AV Graft is able to be used for hemodialysis earlier then an AV Fistula, however there is a higher risk of infection and graft failure. So we always preferentially want to use an AV Fistula over an AV Graft. Sometimes a catheter needs to be placed in a large vein in your neck for more emergent hemodialysis. This catheter can be used until your AV Fistula matures and is ready to be accessed. The best scenario however is to create an AV Fistula BEFORE you need dialysis. This way we give time for the fistula to mature so that when you do need dialysis several months later, your fistula is ready to be accessed right away.